Forbes - 4 Things Top Supervisors Do To Improve The Performance Managment Process, Reviewed. In her recent Forbes Article, “4 Things Top Supervisors Do To Improve The Performance Management Process,” Terina Allen strategizes about how businesses can improve their performance management processes. Of traditional performance reviews and performance management, Allen believes that “winging it has made most employees come to hate the entire process.” Performance management is a vital aspect of any successful company, but it manifests itself as strictly an annual performance review far too often. Effective performance management will “create a culture of accountability and alleviate the fear, pain and resistance employees often associate with performance management,” writes Allen. According to Allen, there are 4 things that top supervisors do to reach a level of effective performance management within the company and their departments and teams. The Performance Scoring Performance Management Application is designed to make these 4 things easily attainable for supervisors regardless of the company. The first thing that Allen identifies is a stock characteristic of effective performance management but is essential and therefore must be stated. “A performance management system ensures that employees and managers are busy doing the right things and accomplishing the right goals which link to the organization’s strategy,” Allen observes. Without transparency there can be no accountability, simply put. “Performance management systems are put in place to ensure performance deliverables remain connected to defined strategic outcomes,” continues Allen. As mentioned, these characteristics are essential to performance management, Performance Scoring is no exception. 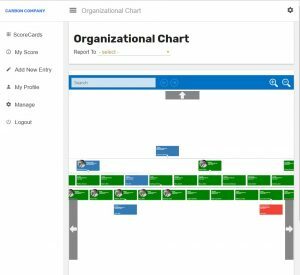 There are several features of the application that key in on transparency (ScoreBoard, FactorBoard, Org Chart, Recent ScoreCards, etc.) and are all products of alignment with company strategy through the Factor System. The next thing that Allen recognizes is that effective performance management must be all encompassing at an organization. “Effective supervisors establish a collaborative framework from the beginning,” and involve their team in the strategizing process. The creation of goals defined and measured by objective metrics is the beginning of the process. However, this thought must come full circle and “prior to any performance review meeting, employees should be asked to evaluate their own performance and make recommendations,” Allen declares. This simply cannot occur properly without employees have access and transparency to performance data. Without a system like Performance Scoring in place this immediately falls back to individual memory and we are right back in a system of subjectivity and bias. Allen then moves to the importance of distinguishing high performance, this gets back to a fundamental way that we learn as humans, positive reinforcement. There must be reasons (often fiscal incentives) for intermediate and low performers to improve, and reasons for high performers to continue their course. Imperative to this thought is the fact that “employees won’t trust supervisors or the performance management system if they don’t perceive the end results to be fair or equitable.” One can clearly see how this is not attained without transparency being paramount. This also coincides with something that Performance Scoring recommends during implementation, which is making the performance management application apart of incentive and recognition programs to celebrate and focus of high performance. The final observation that Allen makes of top supervisors is their commitment to continuous conversation and coaching of their team members. Annual performance reviews “performance management systems are viewed as subjective and punitive rather than objective and beneficial,” hence the importance of continuity. Performance Scoring highlights the importance of real-time feedback to ensure that peer-to-peer feedback and conversation are continuous and employees don’t view one another through a lens of recency bias.